Yes. Bamboo, the stuff pandas eat. Did you know a panda is able to eat 20 to 40 pounds of bamboo per day? Bamboo isn’t only for the giant pandas of China to eat but for us, humans to eat as well! Espescially in Asia. 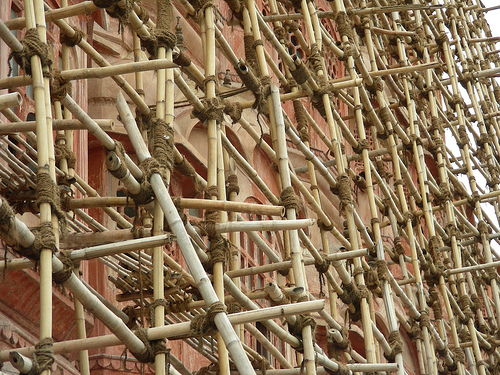 We won’t be talking about that today though but a more logical use for bamboo. Another movie snapshot comes to mind. Remember rush hour 2? 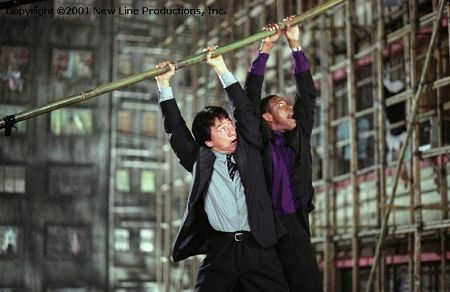 With Jackie Chan and Chris Tucker hanging from the bamboo scafolding? Strong indeed it is. Strong as well as versatile. Here are 5 uses for bamboo that you may have never heard of. We’ll be a little specific and limit it to mostly Asia or we might be here forever. 1. In some places. Bamboo is shaved down and used as a twine to keep things in place;hung up or bundled together, keep the opening of sacks closed, or in traditional cooking with banana leaf. 3. In Asia, bamboo is used in the kitchen. The bamboo tree is sometimes sectioned horizontally and can be used as a drinking cup,verically and you have a bowl,shaved down and you have chopsticks! Not only can we use it as our utensils but also for cooking. In many parts of Asia rice or fish can be cooked in bamboo and then barbequed. 4. Home decor of course. Mobiles, vases and shelves, furniture the options are endless! 5. This may be expected but a hollowed out tube poked with holes and with the tip carved into various shapes makes for a great instrument too flutes and recorders can be made from bamboo. Next Add a little glam with some metal!